Great work, Stanford and Google. Technology is forever changing our lives, and sometimes not always in the way it was originally intended. 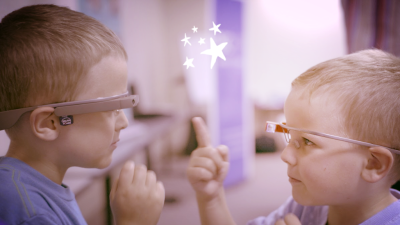 Google Glass, for example, largely considered a flop by tech columnists, has renewed life as a potential tool for helping children with autism to read facial expressions. Can you imagine the implications of such a device for individuals who struggle to navigate the many emotions of their neurotypical friends? As the parent of a child with autism, and a teacher, this particular advancement seems too good to be true. The new technology is a software called Autism Glass: “ The facial recognition software was developed at Stanford University and runs on Google Glass, a computerised headset with a front-facing camera and a tiny display just above the right eye.” Find a video example here. Before we get into why this is such an important advancement, let’s get you all caught up. What is autism? Autism is a neurodevelopmental disorder affecting 1 in 68 children, according to the CDC. These numbers are getting a little older now and as the trends have been consistently showing us, these numbers have been growing exponentially in the last several decades. So, if you are not yet affected by autism in some way, just wait a minute. This is not meant to be a cautionary declaration but a truth, and in fact there are many wonderful things about autism, not limited to, but including, the wonderful people who live with it. Autism affects three main areas of development: communication, social development and repetitive behaviors (and restricted interests). As you can imagine, these impairments can cause some serious trouble for those affected and technology like Autism Glass can offer some much needed support. While I often write about autism, I try to be careful to not speak for the autistic population. My experiences are my own, and while no expert by any means, I feel I can talk about my daughter and her experiences with autism to the best of my ability. Though I will never fully know what it is like to be her, I can attest to what it is like to adore that child and spend my days working to prepare her for the world and more importantly, the world for her. Kate is six years old. She was diagnosed just before the age of two. Kate’s autism, which can be described as only ‘Kate’s autism’ because no two autisms (if you’ll allow me a spell-check defying term) are alike, has been hard on her. She spends a lot of her time fighting bad guys, as any good superhero loving girl would do, but she also spends much of her time trying desperately to make sense of a very confusing world. Kate struggles to read emotions and understand many of the nuances of conversation. This can lead to a very frustrating existence. The idea of Kate getting a little help to read the emotions of her classmates and teachers gives this mom hope for her future. This software promises to be discreet and helpful to a population working hard to have a voice in a world built without them in mind. Great work, Stanford and Google. This is one autism mom who promises to make use of this technology as soon as she can.